John Deere brand loyalists will have an opportunity to see vintage equipment in action at this weekend's Pioneer Farm Days show. For more than 25 years, the Pioneer Farm Days show, put on by the Pioneer Farm Machinery Club, has been displaying vintage farm tractors, engines and machinery. 2014 will be no different, as John Deere tractors, engines, and equipment are set to be featured products October 11-12, at the American Legion Park in Oak Creek, WI. Each year, members of the Pioneer Farm Machinery Club demonstrate their old time machines for the public in an effort to show what life was like in rural America days of the past. The event provides an opportunity for the whole family to experience agricultural machines from yesterday as they perform old time jobs. Vintage steam, gas and diesel tractors and engines will be on display throughout the duration of the event. In addition, attendees will have an opportunity to see things like a real sawmill turn logs into lumber and a threshing machine separating grain from its straw. Children will have an opportunity to explore the Farm Toy Show area, while additional bargains will be offered at the flea and farmer’s market. Kids can also take a ride around the grounds in a barrel train, or take part in the straw pile dive for a variety prizes. 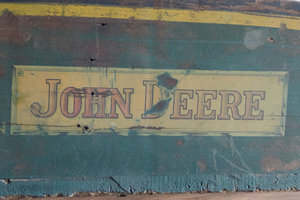 The array of vintage John Deere equipment will likely draw in a considerable crowd as Deere has been previously dubbed a favorite among the Midwest farming base. The event will be open to the public both days from 8am—5pm. Adult admission is $4, while children under the age of 12 will admitted for free.